Does this mean I need to make a new Tombstone? Amelia Clunkenquiet - She's cool and she made history. Contact [email protected] for info on MASC/MASSC. 2014 NASSM in the POCONOS! This tread so much reminds me of 2005 when we were all talking about the coming of the Solstice and trying to get all the information we could. At that time GM was reading this forum everyday. Do you think they are still reading it or just no longer care what we think? Just a thought. It's a sad time for anyone who loved Pontiac. I think GM envisioned the new opportunities with China and they're moving forward like everyone else in Corporate America. The next five years should prove to be very interesting. "Well, yeah...you might be right! This is a Pontiac users group and I can't possibly see why the readers would have any interest in the *latest breaking news* from Detroit relating to a minor item like the death of Pontiac." "I *am* right, and if you check the front page of the forum, two of the threads are up in the news section. Redundancy hardly makes it "latest breaking". Ambulance chasers. No, hearse chasers, except the dearly departed hasn't been pronounced dead yet." 1) I live in the Detroit area, world headquarters for GM. 2) The local Detroit media has a direct pipeline into GM and most of the news that reaches the rest of the world originates through the local Detroit media--and typically, they are the first to hear any news flashes. 3) At the 11 PM TV news broadcast, the Detroit TV media did indeed have the Pontiac is Dead story as the lead "Breaking News" story or "latest breaking news" as you called it above. 4) I then posted this to the forum at 11:24 PM as "breaking news", following the lead of the Detroit media and believing a story of this magnitude would be of interest to this group, especially in a story as fluid and dynamic as this one. Hardly what you called "redundancy", as it was broadcast by the major media as breaking news just 24 minutes earlier. As a relative newbie to this group, I may have accidentally posted it to what you consider the wrong thread, but felt the news was important enough to pass on to the group. Finally, I'm not sure why you consider passing along news of vital interest to this group as "ambulance/hearse chasing"...but, hey, this is America and you are certainly entitled to your opinion. AeroDave : All fine and well, except GM has said it plans to down size Buick to meet tougher CAFE standards, that's why the Lucerne replacement was scrapped. At the same time they aren't announcing Buick getting any new models. That leaves them with Lacrosse and Enclave and in the future something smaller... ?? It almost makes sense, If Buick is going gang busters in China, and that market needs some smaller models, why not just export those smaller models to America? Only problem is, the thought of a Chinese Buick will make most people sick. Creating a downsized product line is not the same thing as moving down market. And the fact that a new model hasn't been announced does not mean that a new one isn't in the pipeline, or couldn't be transferred from either Chevrolet or Cadillac. Not shared, transferred. You missed the point. Entirely. Everyone who has 'their source', has been starting threads on the same item all weekend long. However, we strongly discourage everyone from starting their own thread because they believe their source is more reliable. Oh, and actually, you called it latest-breaking first, I was only using your terminology. Ambulance chasing is a very common phrase, I'm surprised the analogy escaped you. 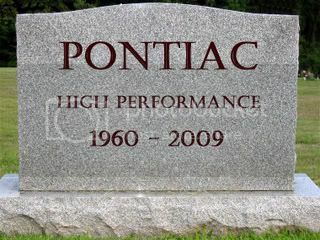 Pontiac is dead and has been for a while. Yes the G8 is excellent but shipping in the G8 from Oz was only a necessary stop gap untill the Camaro is out; it has served its purpose as GM's RWD afforable hot rod. The Torrent and G6 are crappy competitors for their chevy counterparts and do need to go. The last time it seemed like Pontiac was moving cars was when 1998 with the new Grand Prix along with the new Firebird? Sure the Solstice is great but we've always known that it was never going to make money for GM. The CTS can easily fill the shoes of the V6G8 folks, the Camaro SS is even cheaper then the G8 GXP but it uses the same fast engine/parts. There will be a big hole with the Solstice gone, good thing we'll have used C6 Coupes and Convertibles standing by. A 1-2 year old Grand Sport would be the perfect replacement for Solstice. I saw two MGs from the 1960s out this weekend top down in Parker Colorado. Beautiful cars but they stopped making parts for them, what 40 years ago? Yet somehow people find a way to keep them running. If you are 50 now and live to be driving at 80 that means 30 years from now you wont care about parts anymore. There are a hell of a lot more kappas floating around now than there were MGs back in the day. I even saw an Austin Healy this weekend. Looked great. Moss Motors. There were/are two distribution sites; one on the east coast, and one on the west. When I had my MGB's (must have multiples to keep one running), Moss had everything I wanted if I couldn't hunt it down myself. Plus, they were only 40 miles away . You could buy an entire shell or frame from them at one point. Doubt that will happen with the Sol, but ya never know. There is money to be made on cars that are out of production but loved by their owners. This is perhaps one of the darkest days of my life. Years ago I remember driving past a car dealership and seeing all these cool cars that looked so futuristic...the fiero, the trans sport and the firebird and seeing the sign that said PONTIAC in bold red letters. Thinking then how cool a name like that was. I don't know if it was because Pontiac started with the letter P like my name did or what but something spoke to me everytime we would pass that PONTIAC dealership. It told me that if you want to stand apart from the rest, you have to be PONTIAC. So that is what I strived for. My first new car I bought was a 99 Trans Am in 1999 and there was no going back after that. Soon the 99 was not enought and I got my dream LS1, the CETA. Then at the Autoshow in 2002 they revealed the Solstice Roadster and Coupe concepts and once again, I fell in love with PONTIAC, knowing one day I would have a Solstice too. Come 2009, ten years after I bought my first and now on my 3rd Brand New-out of the showroom PONTIAC with getting my Solstice and the dark day dawns....GM announces they are taking away the ONLY American car brand I have EVER identified with my whole life. The brand that always stood for innovation and performance and looks is now no more than a page in automotive history. There will be no future PONTIACS for me to buy. Why GM did you make such a bad decision? I will miss you PONTIAC, my dear friend. Show Car: 2002 Trans Am Collector Edition #619 "Falcon"
Fun Car and Daily Driver: 2009 N/A Aggressive Solstice! "Chief"
Oh, it can definitely happen. Finally got around to renting a Solstice to test the fit this weekend and ran it up through the hills here in NorCal. Along the way passed a group of 8 MGs and a separate group of a half-dozen Opel GTs. The parts don't disappear, they just get more expensive. When I had my MGB, I got all the parts I needed from Victoria British Limited in Lenexa, KS. You could even buy a complete body shell for under $6,000. Some of the parts were pretty expensive, but the complete set of stainless steel trim strips for the side (6 pieces) was only $30. There were a lot more MGB's made than Solstices, tho. The MGB was produced for 19 years, from 1962 to 1980 and 507,790 were made. 393,204 roadsters and 114,586 GT's (coupe). With that many more cars produced, there was a lot more demand for replacement parts. I hope that after GM quits selling parts, we can still find replacements. Well, I suppose less funny and more sad. That's odd. I sincerely thought that YOU missed the point. Entirely. This was not a source from "a friend who has a cousin whose father works for GM...". Again (and the point you miss), is that this was from the Detroit media. Detroit that is the heart, soul and Headquarters of GM. The TV stations thought it was a reliable enough of a story to lead with it and as "breaking news" no less. I don't believe the media would have frivolously broadcast the story or put it on the air unless they were damn sure it was true. Therefore, I thought it was important enough to pass along to the group. As a graduate engineer and elected member of the American Academy of Forensic Sciences, I am fully aware of the phrase "ambulance chasing". However, yes, the "analogy did escape me", as I see no analogy relating to ambulance chasing in passing along a hot story from a source no less than the Detroit automotive media, who believed it to be reliable and true. What I don't get is why they are keeping GMC. GMC's area already rebadged Chevy trucks. And for the commercial truck line, people probably wouldn't care if it was a Chevy or a GMC. You forgot the jerks in D.C.
We need those addresses too. They had more a hand in this then we'll ever be told. Sly, black leather, black top, 145 NA, loaded. Seems like it has everything but On-Star.